Wayward Pines, the new series based on the trilogy of books by Blake Crouch, is scheduled to begin airing on Fox on May 14. Fox is excited about this series and wants you to be excited too. As a result, the pilot of Wayward Pines, “When Paradise is Home,” has been made available worldwide through a whole host of streaming options from April 24 to 30. If you don’t want to wait until May to watch the premiere of Wayward Pines, you can check it out at Fox on Demand via participating pay-TV providers, Fox.com, Hulu, Amazon Instant Video, Google Play, PlayStation Store, VUDU, Xbox Video, and Facebook. Fox’s innovative approach is likely to attract some viewers who don’t normally get invested in summer television series. Showcasing the first episode of Wayward Pines, “When Paradise is Home,” reminds us that as well as having a cast of cinematic stars, M. Night Shyamalan is one of the executive producers of the series and directed this pilot episode. 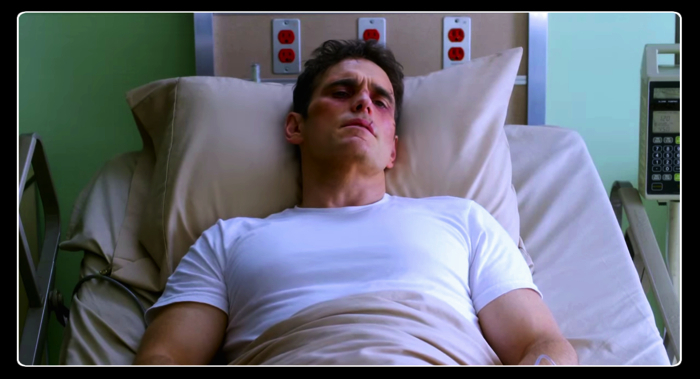 Wayward Pines stars Matt Dillon as Secret Service agent Ethan Burke. While investigating the disappearance of two agents, Ethan finds himself in the town of Wayward Pines after being in a car accident. When Ethan wakes in the mostly empty hospital, he meets Nurse Pam (Melissa Leo), one of the town’s most interesting residents. She tells him the driver of his vehicle didn’t survive and that the Sheriff has his phone. Back in Seattle, Ethan’s boss Adam Hassler (Tim Griffin) informs Ethan’s wife Theresa (Shannyn Sossamon) that there’s been a car accident. Though the body of the agent driving was identified, they find no sign of Ethan’s remains. Ethan and Theresa have a son Ben (Charlie Tahan), who may be too clever for his own good. After it becomes clear that he isn’t going to be able to contact the outside world from the hospital, Ethan rips out his IV and leaves, ignoring Nurse Pam’s protests. Ethan is unable to get into the Sheriff’s department, but finds comfort and a meal from bartender Beverly (Juliette Lewis), using her phone to leave a message for his wife. On his check Beverly writes an address and a note indicating that the crickets are not what they seem. Walking down main street Ethan discovers that the crickets of Wayward Pines are in fact cricket sounds playing from speakers in the bushes. Perhaps Wayward Pines is trying to win a “Village of the Year” award. The next morning an irate hotel clerk kicks Ethan out when he’s unable to pay for his room. Ethan goes to the address on the check because Beverly had told him it was her own address in case he needed help. Instead he finds the bound body of one of the special agents he is looking for. The other agent Ethan is searching for is his former partner Kate Hewson, with whom he had an affair. Ethan reaches out to Sheriff Pope (Terrence Howard) for help, but doesn’t get the assistance he is expecting. The Sheriff appears lackadaisical, yet slightly sinister. Though the sheriff claims he doesn’t have Ethan’s cell phone, Ethan is able to use the Sheriff’s phone to call his family and his supervisor at the Secret Service. In both cases he’s only able to leave a message. Curiouser and curiouser. Ethan returns to the bar, looking for Beverly, but finds a man (Christian Tessier) who claims she doesn’t work there. Frustrated, Ethan starts to get aggressive. The man knocks Ethan out, radioing someone with the message, “10-16-28 is not doing well.” Well now, that doesn’t seem normal. Ethan finds himself in the hospital once more. Psychiatrist Dr. Jenkins (Toby Jones), who knows that Ethan has a history of mental illness, tells him there is bleeding on his brain, resulting in a dissociative breakdown. Ethan explains that he’s not delusional, telling Dr. Jenkins, “You see, it’s not me. It’s the town.” That always works as a defense. Dr. Jenkins informs Ethan they’re going to take him to surgery to drain the hematoma, and when he protests Nurse Pam gives Ethan a sedative. As Ethan lays handcuffed to a gurney outside a room with scary surgical instruments, the bartender Beverly comes to the rescue. Together they manage to attack Nurse Pam and get out of the hospital, hiding in a cemetery vault. Before the sedative completely knocks him out, Beverly tells him that the agent he found was killed for trying to escape. She tells Ethan that she came to Wayward Pines in 1999, strangely believing that she has only been there for a year. He wakes alone in the cemetery vault and wanders back into the town. He sees a woman who looks like the missing agent he is looking for – his former partner Kate Hewson (Carla Gugino). When she sees Ethan she hurries her husband, Harold Ballinger (Reed Diamond), back to the house, while desperately trying to act like nothing is wrong. Ethan follows them and tries to talk to her, and she attempts to keep up a front initially. When it becomes clear Ethan is not going to play along, she whispers, “They’re watching us…. They’re listening.” She tells him she’s lived there for 12 years and he objects, “That’s impossible. I was with you 5 weeks ago.” She doesn’t have answers for him and tells him that he’s putting her and her husband in danger. Before he leaves he asks her, “Is it happening again? Am I having a relapse?” She shakes her head “no” and goes back into the house. Dr. Jenkins, who appears to be more than a hallucination, had made a trip to Seattle to meet with Ethan’s boss Adam. Adam seems to acquiesce and walks away. He gives up pretty easy for a Secret Service agent. We see that Ethan’s wife Theresa hasn’t given up and still waits for a call from Ethan, not having received any of Ethan’s messages. Ethan decides he’d better make a run for it, stealing a car and trying to drive out of town. Yet, just when he thinks he’s made the town boundary he finds himself driving back into town again. He leaves the car on the road and tries to find an exit in the woods. Much to his surprise, and ours, Ethan comes upon a huge concrete wall with an electrified fence on top. The sign on the fence warns, “Risk of death. Return to Wayward Pines. Beyond this point you will die.” As the camera pans upward, we can see that Wayward Pines is mountain valley surrounded by concrete walls. When he returns to his car, the sheriff arrives. Wayward Pines provides the viewer with a lot of information in “When Paradise is Home.” Much more of the story was revealed than we are used to in a pilot episode. Despite all the people walking around the town acting normal, it becomes evident early on things are not what they seem. If the story was told only from Ethan Burke’s point of view, we might have wondered if he was actually going mad. By including his family, the Secret Service investigation of the accident, and finally showing us Dr. Jenkins interacting with Ethan’s boss in Seattle, it becomes clear that Ethan Burke really had a life outside of Wayward Pines and his absence has been noted. Though it wasn’t completely out of left field that Ethan’s boss was complicit in his confinement in Wayward Pines, it was shocking that the show revealed it in the pilot. It was refreshing and intriguing to get so much dramatic story, not just backstory, in a pilot. That being said, there is still a lot of mystery to explore. We don’t know what exactly the town of Wayward Pines is and why people are being forced to play certain roles. Is it a prison, a town-sized psychiatric facility, an experiment, another planet, Purgatory, or something entirely different? For all we know Dr. Jenkins may be a Djinn keeping Ethan in a dream-like state, though it seems unlikely. What’s up with the time distortion in Wayward Pines? Beverly thinks she has only been there for a year when she actually arrived 15 years earlier. Kate claims she has been in Wayward Pines for 12 years, while according to Ethan’s timeline she has been there less than 5 weeks. Ethan notes that Kate physically looks older as well. Even though Kate said she didn’t have answers to Ethan’s questions about time, we are hoping someone does. 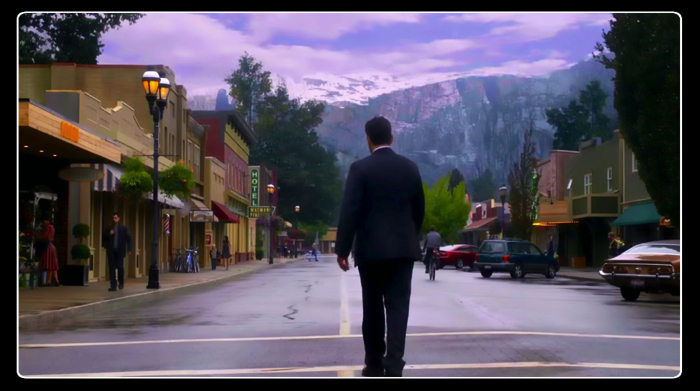 Perhaps the biggest mystery of Wayward Pines is its genre. The questions around Ethan’s sanity and what is real, as well as the exciting attempt at escape, had the feel of a psychological thriller. 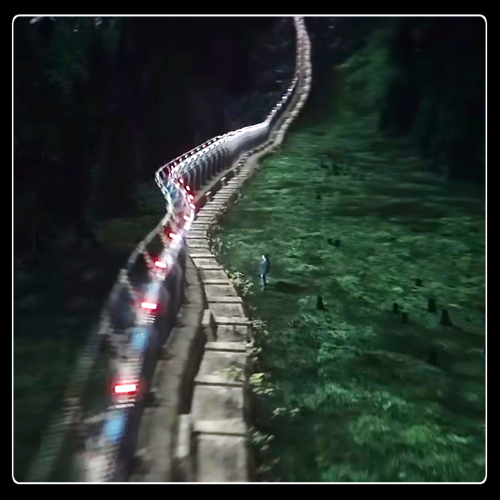 The wall surrounding the town that is keeping them trapped in a mountain valley and the possible time distortion alludes to a science fiction explanation. Yet the manner in which Ethan was unable to drive out of the town, reappearing back on the road into town, certainly had a supernatural feel to it. 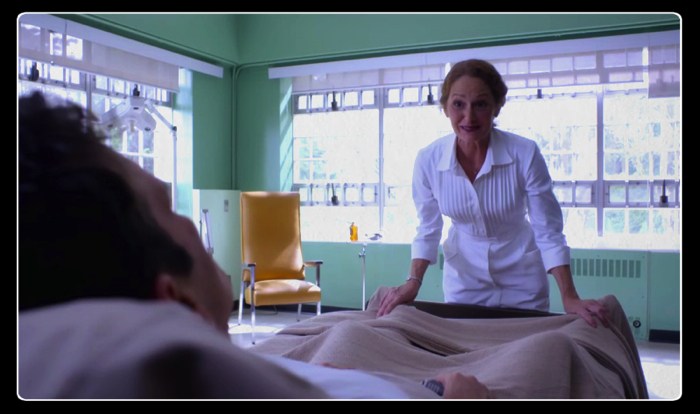 “When Paradise is Home” introduced us to quite a few Wayward Pines characters. Though we are not yet that invested in the Seattle characters, we are eager to learn more about Beverly, Kate, Nurse Pam, and Dr. Jenkins. Melissa Leo as Nurse Pam was fantastic to watch. Nurse Pam felt like a mix of Nurse Diesel from High Anxiety and Carol Peletier from The Walking Dead. She was both scary and hilarious. 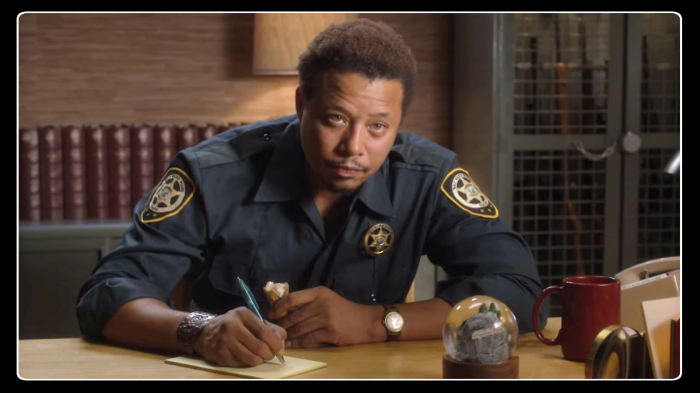 Terrence Howard as Sheriff Pope was also very well played. Despite having little dialogue, Howard made his scenes the most compelling to watch. There was an underlying tension in his scenes that made us feel like anything could happen. 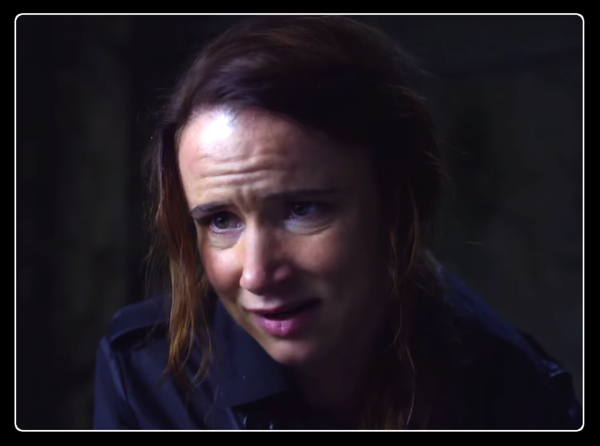 Both Juliette Lewis as Beverly and Carla Gugino as Kate showed us the terrifying nature of Wayward Pines through their portrayal of intense fear hidden behind forced cheerfulness. Well, it worked Fox. Giving us this advance view of Wayward Pines by making “When Paradise is Home” available by streaming has left us intrigued. Though we’re glad we don’t live in a time-distorted world like Wayward Pines, episode 2 can’t come too soon. Good review, I’m guessing you have not read the books. Having read all three books i’m glad to see that (so far) they are following the book exactly rather than going the route of Under The Dome and The Walking Dead where they have deviated from the book material to the point that they are hardly recognizable when compared to the source material! Hope they manage to complete the whole series. My only complaint is that I feel that they cast the Nurse too old when compared the book and some of the the things she gets up to will be interesting to see how the develop in the series given the age of the Actress. Never read the books, making Wayward Pines that much more mysterious. Can’t wait to see what that nurse gets up to. Book to screen transitions are challenging, some better than others. It’s interesting that the pilot so closely follows the book. Hopefully they will continue to do justice to the trilogy.